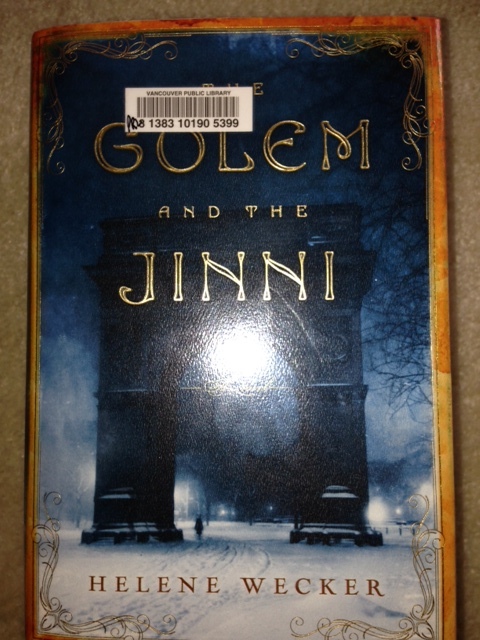 Book Reviews in brief: The Golem and the Jinni, The Abominable, etc. I have powered through a pile of library books and some, in fact most, have been absolutely wonderful. I’d like to say I bought them all but I can’t afford my own reading habit. There are some books I will buy for my Reader and then I hoard them for holidays and for reading on the elliptical machine. Right now Margaret Atwood’s Madaddam and Bill Bryson’s One Summer are on the Reader for when we go to Hawaii. Also G.J. Meyer’s history of World War I, A World Undone. Remember him? He wrote about the Borgias and the Tudors and I am a fan. But I thought I’d quickly run through some of the fabulous books that have kept me reading late into the night…. 1. The Golem and the Jinni, by Helene Wecker. I didn’t know what to expect from this book but from the first paragraph I was totally mesmerized and neglected my work and family so I could finish it. I think everybody’s enjoying this book because it took AGES to get from the library. I love stories about magical creatures finding their way in our world and in this novel a golem and a jinni find themselves in New York City circa 1910. I was rhapsodizing about this book to anyone who would listen, forcing my husband to look up from the sports pages, and found that I had to explain what a golem was quite a few times. I guess everyone hasn’t read Marge Piercy’s amazing book He She and It, and if you haven’t you should. Its main point is the immorality of creating a self-aware intelligent being for your own purposes and denying its right to its own life. In Piercy’s story a futuristic self-aware robot is created for the defense of a community, yet it has its own needs and desires. Interwoven with this narrative is the story of the golem of Prague, the clay man brought to life by a rabbi who also desires to protect his community. In Wecker’s book, the golem’s master dies within hours of bringing her to life and she arrives in New York masterless. Wecker just takes it from there and she does it beautifully. Thank you, Ms. Wecker, and please get right to work on your next novel. I’ll buy it. 2. We Are All Completely Beside Ourselves by Karen Joy Fowler. On the theme of intelligent self-aware beings, this book is about the fallout when a family that has adopted a chimp is forced to give her up. I heard today that there is a lawsuit in the United States being filed on behalf of a male chimp named, I believe, Tommy, which is interesting as it argues Tommy’s rights as a person, so the whole issue of personhood will soon be wrangled in the courts. This book is gripping and made me remember the films from Psych 101 with the signing gorillas and chimps. I didn’t really consider what would happen if one of them threw a grad student into a wall. If you raise an ape with a human family, they believe they are human. To then – even though it’s clearly necessary for everyone’s safety – send them to an ape research facility is incredibly cruel. It’s hard to believe that smart people like psychology professors don’t see the eventuality looming, but there you go. Fowler’s previous book, The Jane Austen Book Club, was a good read but this one blew me away. I needed to take a break after I read it so I could properly process and then I told the whole story to Justin. It’s ok, he wasn’t going to read it anyway. I’d love it if he would read more fiction, but you know. Horse, water, drink. 3. 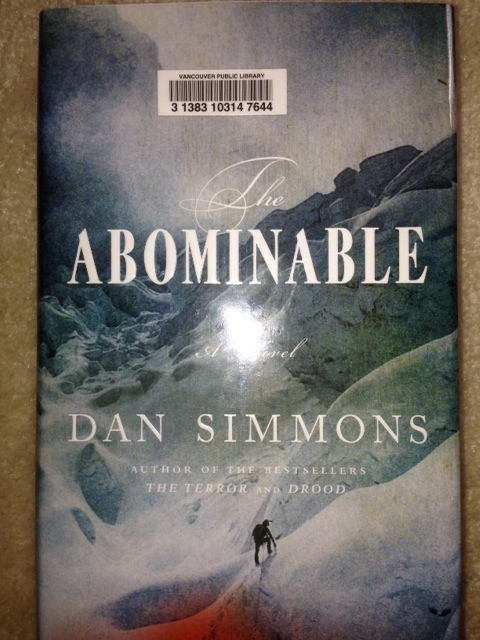 The Abominable by Dan Simmons. I just love books about climbing, even though you would never get me near a mountain. I’m fascinated by the thought processes of people who can’t wait to endanger their own lives and those of others in this totally unnecessary physical feat. Into Thin Air? Awesome, and it got me started on this genre. The Abominable is a novel about climbers in the 1920s and has a great spy-novel-ish plot. There are lots of minutely detailed descriptions of climbing that made my eyes glaze over a few times, but overall it’s great fun to read. It’s even more fun if you read it with Google Earth by your side so you can look up the Matterhorn and the Eiger and say knowledgeably, “Yeah, that north face does look pretty tough,” from your warm and cozy bed. 4. A Constellation of Vital Phenomena by Anthony Marra. I put off reading this book because it was about the Balkans and everything I’ve read about the Balkans has been devastating. Then the due date loomed and I was forced to and I was glad I did. This book is, unsurprisingly, devastating but it’s a very good read nonetheless. It’s one of those “small world” plots in which the main characters’ stories are entangled together but they don’t know it and the reader gets to put it all together. Layers of tragedy and irony. Cue the dolorous minor-key Chopin Nocturne. 5. Neverwhere by Neil Gaiman. Gaiman’s books are just pure fun. My seven-year-old watches a good movie with wide eyes and a big smile on her face (it’s hilarious) and that’s what I look like when I read Neil Gaiman. I think I’ve already established myself as a fan in a previous blog post. I love it when characters from our world encounter some alternate reality and are going along with the quest or whatever but their internal thoughts are, essentially, “WTF!” That’s so fun. 6. 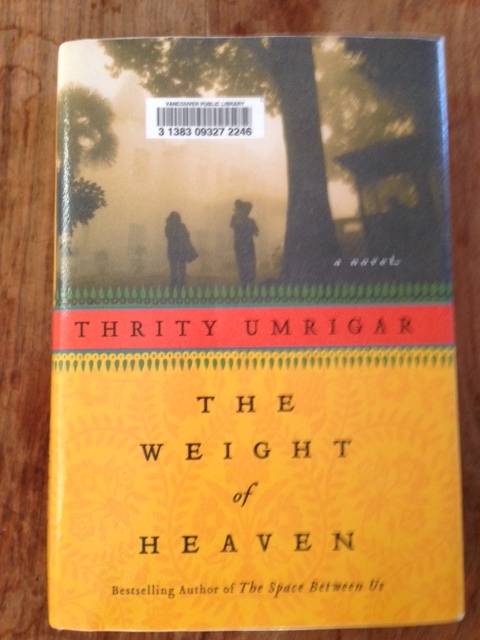 The Weight of Heaven by Thrity Umrigar. Another devastating tragedy, but beautifully written and so worth staying up late to finish. You know it’s well written when even though you know where this is going you still read on and on because every word is worth savouring. Then you get to the end and it’s heartbreaking but you knew it was going to be. It’s like watching a car crash. Horrid but it gets your attention. Let me start you off: A couple from Ann Arbor move to India after their 7-year-old son dies of meningitis. That’s just the beginning and it gets even more tragic. And it’s set in India, so cultural misunderstandings just make matters worse. But it’s so good.